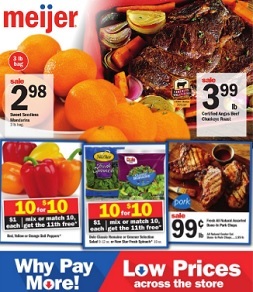 Meijer Weekly Ad, valid April 21 – April 27, 2019: $3.99 lb Certified Angus Beef Chuckeye Roast; $2.98 Sweet Seedless Mandarins; $.99 lb Fresh All Natural Assorted Bone-In Pork Chops; 10/$10 Dole Classic Romaine or Greener Selection Salad 9-12 oz. or New Star Fresh Spinach 10 oz; 2/$5 Purple Cow Ice Cream; $1.99 Ritz Crackers 8.8-13.7 oz., Meijer Pita Chips 8 oz. or Nabisco Snack Crackers 7.5-9.1 oz. ; $1.99 General Mills Cereal 11.1-24.6 oz. or Kellogg’s Cereal 9-18.7 oz; $6.99 True Goodness Organic Nuts; $4.49 True Goodness Organic Orange Juice; 2/$5 True Goodness Organic Almondmilk; $7.49 True Goodness Dry Dog Food; $1 Large Mangos or Honey Mangos; $3.99 lb Certified Angus Beef Ground Beef from Round; $1.99 lb Bulk Opal Apples; $.99 lb Eggplant, Zucchini or Yellow Squash; $4.99 20 Ct. Ultimate or Seasonal Shaped Sugar Cookies; $5.99 BBQ Bay Grilling Shrimp or Skewers; $3.49 Angel Food Cake; and more. Find all deals and offers in the latest Meijer Weekly Ad for your local store.